Last year when I originally posted on my Dad's pizzelle cookies, I stumbled upon this pizzelle recipe at Maryann's delicious blog, Finding La Dolce Vita. I was smitten with Maryann's pizzelle iron which had a unique pattern. I decided instantly to surprise my dad with one (after all, he is the official pizzelle maker in our family). Thinking she bought her's in Italy, I was shocked when she told me it was a Toastmaster pizzelle iron from Walmart! Unfortunately, Walmart no longer carried it, nor did any of the dozen other places I tried. Maryann said she would keep an eye out for me and let me know if she found one. A few weeks later, a box arrived in my mail. It was Maryann's pizzelle iron. She said she knew that "it would be in good hands" with me. I couldn't have been more touched. Here is a woman who lives over 2,500 miles away, whom I never met, and who had sent me her beloved pizzelle iron. I promised Maryann I wouldn't be posting on the pizzelle iron until it could be christened with my Dad. So when he came to visit in September, we (well, mostly he, as I was busy snapping pictures and eating cookies), made a batch of pizzelles with it. They were better than I ever remember. Grazie, Maryann. You are a special person. 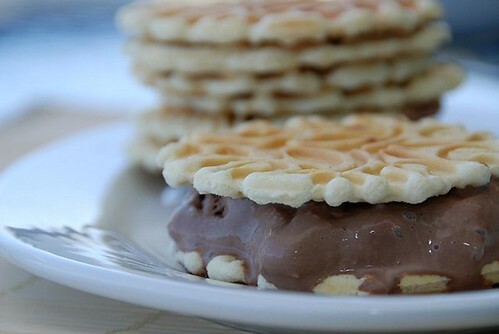 For a truly splendid treat, make pizzelle ice cream sandwiches! My favorite is rich chocolate ice cream (shown above) or pistachio gelato. It's heaven I tell you, heaven. Pizzelles are always a big hit at parties, so I'm bringing some to Aparna of My Diverse Kitchen for her blog party. And since they're baked with licorice-scented anise seed, I'm sharing them with Anita of Dessert First, who has chosen spices for this month's SHF. Since I'm thankful for my friendship with Maryann and for being able to bake with my dad, I'm sending my pizzelles to Val of More Than Burnt Toast and Ivy of Kopiaste who would like to know what we're thankful for this November. You make me want to go out and buy one tonight! Susan, I don't know what to say. I think I'm blushing! I didn't know I could do that anymore! oh, i want your dad to be my dad! he's awesome. i love pizelles more than anything but have never broken down to buy the grill. i might have to this year. a pistachio ice cream sandwich sounds delicious!!! Awesome post, Susan. You and your dad did a great job! I want that Nutella filled one...just one and I'll never ask again, please! Gosh, I'm so touched by this! Maryann is so nice :) Food bloggers unite! This design is so pretty! Lucky you to have a reader like Maryann! I remember reading about pizzelle in another blog some time ago and I was impressed by the lovely designs. Wow, your cookies look so beautiful especially those filled with pistachio ice cream. Thanks for submitting it to the WFD - Time to be thankful event. I have never tried these, Susan, but I have seen them a few times after I started reading food blogs. I'm intrigued - they look so delicious! Pizzelles are a holiday staple in my house back in the States--my non-Italian mom is the pro with the iron. YUM! They are my mom's favorite. We love to make them. These look fantastic. Great for a snack...or breakfast...or lunch...lol! ooh! i think my mom has her grandmother's pizelle iron. for the holidays, there's nothing like 'em. oh, and of course my mom's strufoli! Wow, how generous of Maryann! As for the pizzelles, we always make ice cream sandwiches out of them! That is SUCH a great story. I am just loving this whole blogging community. There is so much camaraderie! And your pizzelles look perfect. How wonderful that someone from the food-blogging community could reach out and make a special post like this possible! You are so blessed! When I first saw ur pizzelle post, i was wondering if i have already seen it here as I clearly remember ur last year's post...and then I read about the touching gesture from maryann...wow....!!!! thats all i can say! 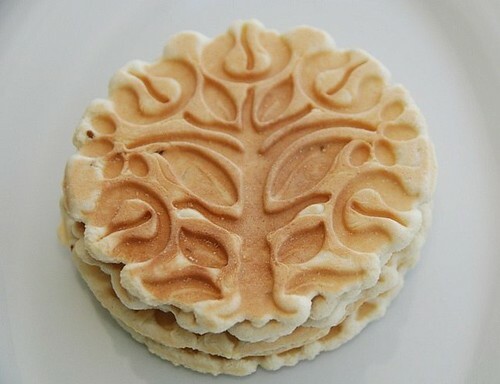 I love the beautiful pattern on the pizzelle maker! I've never had the urge to make these myself, but now I have the urge to eat a couple of them. Lovely cookies! Wonderfully touching post. You got me curious so I went searching and discovered pizzelle irons on ebay!!! Happy cooking. lisa-That's what I like to hear! peter-Oh, nutella would be sublime. ivy-It seemed like the perfect entry for your event. Thanks for choosing it! val-I'm so happy you like it. michelle-Really? I'm surprised to hear that. Maybe you need to take a trip back to the States! stacey-They're so fun, aren't they? nicole-It was incredibly generous of her. 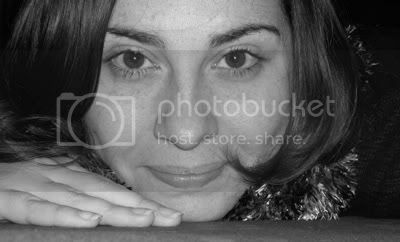 deborah-I am fortunate to have Maryann as a friend. bren-They are sweet in more ways than one! redmenace-Hope you find one you like! One more reason to love Maryann! What a delightful gesture and a wonderful story! And, for the second time in a couple of weeks, you are tempting me to go out and buy another appliance! I have to say this is one cookie I have never made. Although I would like to someday! The ice cream sandwiches look delightful! look delicious. Especially the one with the ice cream!! How lovely that she sent you her pizzelle maker! I've tried these before, but judging by the look of them, I know I would like them. I especially love the beautiful designs you can get. These cookies are so pretty and they must be fantastic with icecream, I'm sure. Thank you for joining me in celebrating, Susan. And a large part of the credit to your Dad, as well. So very cool! these look gorgeous. Back up. 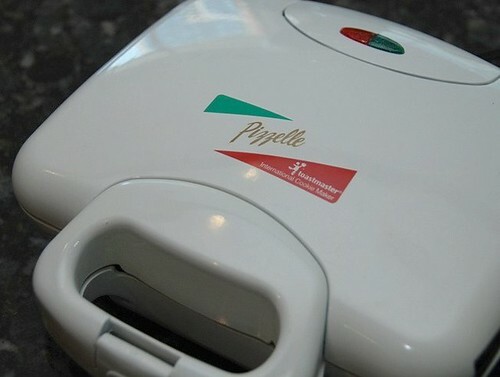 There's a pizzelle machine!? Like, whoa. And those ice cream sandwiches are almost as cute as you! Almost. I remember being taken with your pizzelles first time round, and spent an age myself trying to find one here. They look totally awesome, you lucky girl! 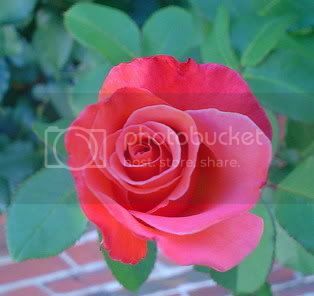 Susan - what a wonderful post! I also come from an Italian-American family and have many fond memories of my dad making pizelles for every holiday and event (Christmas, Easter, Thanksgiving, weddings, etc). We have recently convinced him to upgrade his pizelle maker (after 40 years! )and now the pizelles are even better! I love reading your stories about food & family. I've had a pizzelle iron for years, sitting in my cupboard. I'm embarrassed to say I've never used it. :( But your story and photos have inspired me, so I will try it out with your recipe and the great visual instructions. What a wonderful and thoughtful gift! Those pizzelle look fantastic! joey-Oh, how kind of you. annie-She is a dear indeed. aparna-What a generous, heart-felt comment. I think you too are a lovely lady. 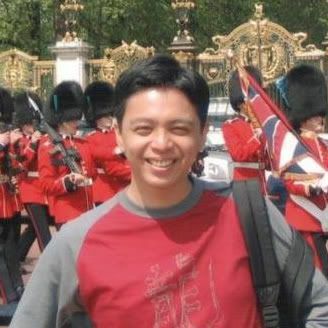 nic-They aren't in England? Oh, that's really too bad. bal-I'm glad you liked it. tb-Wow! He was willing to change after 40 years? That's amazing. I love this family tradition and am so pleased to hear you and your family do too. judy-Oh, please do and let me know! What gorgeous cookies - their appearance is very striking. And isn't Maryann wonderful for making this happen!